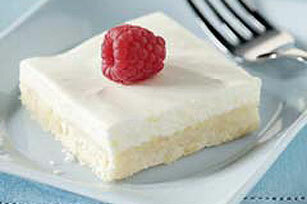 These creamy lemon squares have a fluffy-as-a-pillow layer made with melted marshmallows and whipped topping. Preheat oven to 350°F. Mix flour, butter and sugar; press firmly onto bottom of greased 8-inch square baking pan. Bake 15 min. or until lightly browned. Meanwhile, mix marshmallows, lemon peel and lemon juice in large saucepan; cook on low heat until marshmallows are completely melted and mixture is well blended, stirring constantly. Remove from heat. Cool crust and marshmallow mixture completely. Add whipped topping to marshmallow mixture; stir with wire whisk until well blended. Spread evenly over crust. Refrigerate at least 2 hours or until slightly firm. Cut into 16 squares to serve; top each square with 1 raspberry. Store leftover squares in tightly covered container in refrigerator. One medium lemon should easily yield the 2 tsp. grated lemon peel and 1/4 cup lemon juice needed for the preparation of this recipe.